Has housing turned the corner for good? 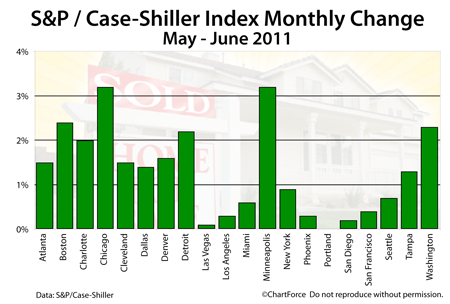 The June 2011 Case-Shiller Index reading posted strong numbers across the board, with each of the index’s 20 tracked markets showing home price improvement from May. Some markets — Chicago and Minneapolis — rose as much as 3.2 percent. The rise in values is nothing about which to get overly excited, however. The Case-Shiller Index is just re-reporting what multiple data sets have already shown about the summer housing market; that it was stronger than the spring market, and that a recovery is underway, but occurring locally, at different rates. Denver, Dallas, Washington D.C., and the “California Cities” bottomed in 2009. Each has shown steady improvement since. None of the Case-Shiller cities showed negative growth between May and June 2011. 12 of Case-Shiller’s tracked cities have improved over 3 consecutive months. In isolation, these statistics appear promising, but it’s important to remember that the Case-Shiller Index is a backward-looking data set, focusing on just a portion of the national housing economy. As an illustration, the Case-Shiller Index’s “national report” only includes data from 20 cities nationwide. They’re not the 20 biggest cities, either. Smaller metropolitan areas such as Minneapolis (#48) and Tampa (#51) are included. Larger ones including Houston (#4), Philadelphia (#5) and San Jose (#10) are not. In addition, the Case-Shiller index fails to track sales of condominiums, multi-unit homes and new construction. In some markets, including Chicago, these excluded home type can represent a large share of the overall market. The Case-Shiller Index is a fine data set for policy makers and economists. It describes the broader housing market and shows long-term trends. For the individual home buyer in Brentwood , however, it’s much less useful. More than “broad data”, you want focused data that’s current and relevant. The best place for data like that is a local real estate agent.